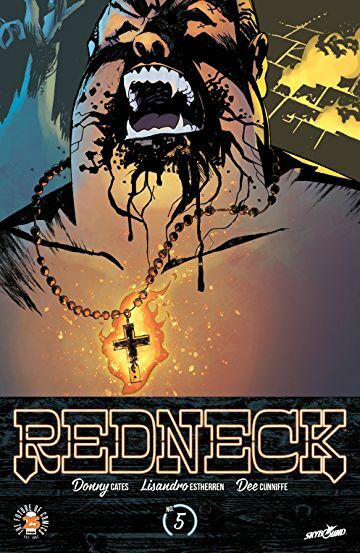 'Redneck' continues to be one of the best-written dramas in comics. For a vampire-inspired story. Don Cates is more interested in developing well-crafted characters and complicated family dynamics amid a century old feud than relying on tired tropes. This issue is an example of dialogue over violence, conscience over vengeance, and reconciliation over aggression. Bartlett's been the conscience of the series thus far. Even though he's not a blood relative of the Bowmans, being a vampire too makes him a part of the family. The death of Slap has turned the Bowman's lives upside down and rekindled the feud with the Landrys. It's reached a boiling point with J.V. about to kill Father Landry. Bartlett has to stop him and explain Landry wasn't at fault. This is not your typical vampire tale and that's a blessing. The turmoil found within each character is all too human. Anger, fear, resentment, guilt, are as universal as any emotion and it's what churns within many of Cates' characters. The murder of Slap, the feud with the Landrys has ruined the idyllic life the Bowmans had established, keeping to themselves with a farm and a business to shield their immortal hungers. 'Redneck' is more Justified than True Blood and that's just fine. The drama is organic, not contrived and not settled in some elaborate way simply because they're vampires. It's as southern fried drama as it gets without the convoluted monster movie rules. It's just good ole storytelling about ideas and history. And yet, nothing will prepare for how this issue ends. Lisandro Estherren does some of his best work in the series. This time, it's Lisandro's layouts that put the focus on the heightened conflict between J.V. and Father Landry. It's staged similar a boxing match as the camera swings around from one combatant's perspective to the other. The spacing is perfect, giving the scene room to breathe between panels. Dee Cunniffe sets the proper tone with somber yellows, melancholy blues, and ultimately menacing cyans. 'Redneck' is an immersive vampire drama that defies convention and invites more thought than we're used to in a supernatural comic. The series' biggest mystery is unraveled after a tension-filled first half of an issue. Cates and crew have created another thought-provoking thriller that will sneak up on you. Issue five should leave you rattled.